Wow! The response to our new creation Shop Floor Man has been wild. We at Shop Floor Automations had an idea to try and represent what our customers, who work in the manufacturing industry, go through via a comic strip character. The reception is more than we hoped for. 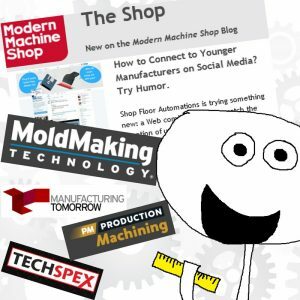 “Shop Floor Automations (SFA) is doing its job to attract a younger manufacturing audience by working its social media channels and developing a comic strip series called Shop Floor Man Presents,” Christina M. Fuges of MoldMaking Technology writes. “With a younger MFG audience on the horizon, SFA is looking to make an impact within the social media landscape, just as the company has made its mark in the shop floor automation field,” Manufacturing Tomorrow published on October 13th. See our archive of Shop Floor Man comics! Want to see more of Shop Floor Man, or have feedback on some future adventures he can go on? Tweet SFA on Twitter at both @SFA_inc and @ShopFloorHumor. You can always call us, too, at (877) 611-5825!